www.bludoors.com/ ), they were inspired to use the name "Doors" from the name Bill Gates' used for his own product, "Windows". The story of the Nigerian brothers is a classic story of how great entrepreneurs are launched. In the series of the "Fast Follower", I pointed out that when a service or product that you are using frustrates you, instead of railing insults at some poor shop assistant, or call center operator, just sit down and make something better. Even at the tender ages of 9 and 7, they had already developed an interest in computers, and a few years later were learning CODING. I have already said that the next billionaires in Africa, will include those who learn computer Coding. In Hong Kong, Coding is now being taught to five year olds! The two boys taught themselves Coding on platforms available on the Internet such as the Code Academy. As they got better they recognised that there was a "need" to develop a "browser" which could be used with the type of cheap smart phones that people in Africa generally buy.... Cheap phones or imitations cannot process data as well as more expensive phones, causing the user many problems. Imagine the audacity of these two youngsters; to sit down and re-imagine the Browser from the mighty Google, known as "Google Chrome".......But they did! Today they have their own business promoting their own browser which they called, "Crocodile Browser Lite". It is available for free on Google Play Store: (https://play.google.com/store/apps/details?id=com.webs.enterprisedoor ). 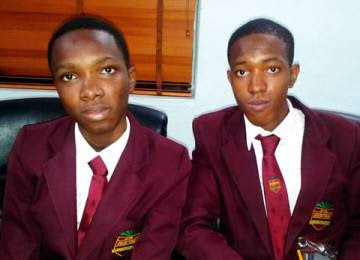 If you want to see Africa and the World's next "Bill Gates", they will look like these two young boys from Nigeria! This is how Bill Gates and Paul Allen also started. These young boys will not need to go looking for money, money will come looking for them! ...."ProVISION always follows a great VISION"